I have mixed feelings on paleo baking. Most of it (ok, all of it) stems from the fact that I’m not great at it. I find it so hard to find the perfect balance of mixing different flours to achieve the consistency I’m looking for. 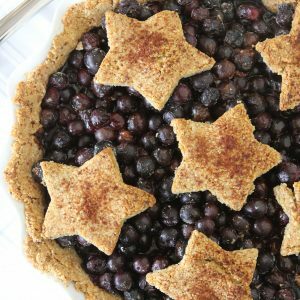 I also find that one brand of almond flour will behave and feel very differently from another brand making it impossible to create a consistent dessert. Truthfully, when I post a paleo baking recipe on my blog, it’s after 3-4 attempts trying to achieve that perfect balance. 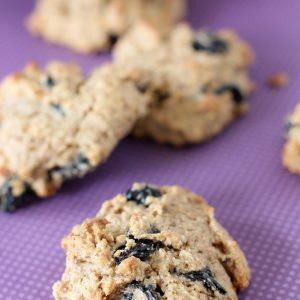 I can’t count how many paleo baking recipes that I’ve tried from Pinterest (or even “real” cookbooks) that have quickly become a Pinterest fail. 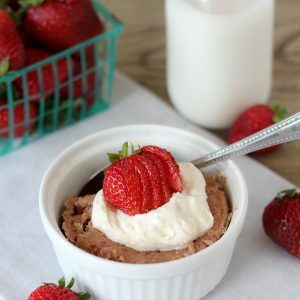 With that being, said I know people love being able to recreate their favorite treats into a cleaner and healthier version, like this amazing chocolate cake and I’m all for it! I am happy to say that no longer do we need to playing the paleo baking guessing game! I’ve recently found my love for Simple Mills. Simple Mills makes an assortment of high quality, clean baking mixes that are all gluten-free and paleo friendly. The ratios are already figured out for you! Besides baking mixes, they’ve also incorporated a line of crackers that follow those same guidelines. And I’m officially obsessed. Not only are their products convenient and consistent, they’re delicious! You can check out their full line of products HERE. Their line also includes cookie mixes, bread and pizza mixes and more. While you’re there don’t forget to pick up some of their crackers. They are hands down the best grain-free crackers that I’ve had to date. Did I mention how versatile their mixes are? There’s so many things you can do with them! 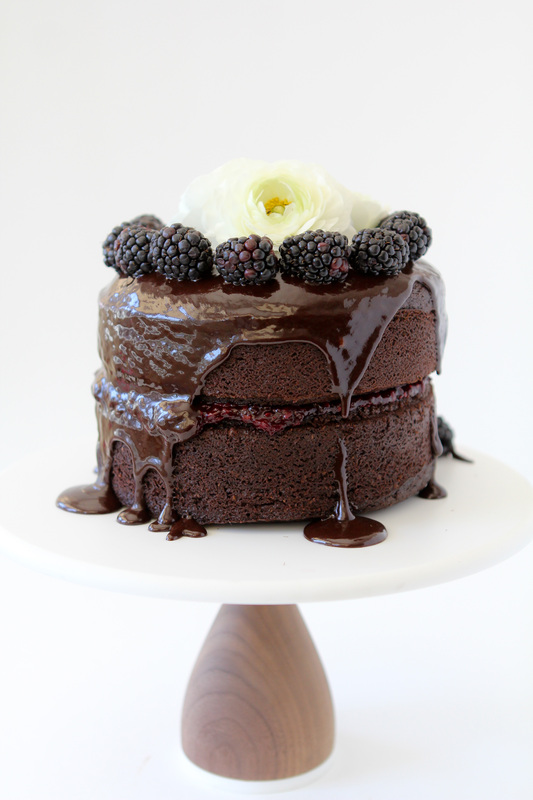 Like this Blackberry Filled Chocolate Cake with Ganache! And yes, it tastes as amazing as it sounds. I love how the tang of the blackberry compliments the rich chocolate of the cake and ganache. It’s definitely a cake that will make anyone’s day. When creating this recipe, I wanted the other components to be easy to make as well. There’s no point in having the ease of a mix if you’re going to be spending the rest of the day in the kitchen cooking up the other pieces. If you can stir and heat, you can make this cake. I also have to confess that I’m not the world’s best cake decorator as my unsteady hand and impatience don’t seem to bode well for the task. However, I’ve found some tricks along the way that let’s you create a beautiful dessert without having the skills of the pros. One for instance, adding fresh flowers immediately brings the beauty without the need to pipe in a sugary version. So next time you’re baking a cake up, grab a bunch of small flowers and all of your friends will be impressed with your handiwork. I hope you enjoy this cake as much as my family and friends did. Make sure to Pin it for your next special occasion and head over to Simple Mills and pick up some of your soon-to-be favorites. 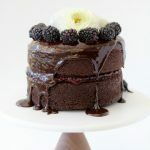 A delicious chocolate cake filled with blackberries and topped with chocolate ganache using Simple Mills Chocolate Cake Mix. Paleo friendly and gluten-free. I made your cake and everyone loved it!!! Quick question though, did you mean an 8 inch spring form pan? I had a hard time finding a 6 and had to order one. When I used it the mix raised far too much and I had to cut some off the top. Also the box calls for an 8 inch pan…. I’m so glad you guys loved it!! I did use a 6 inch pan, I know it’s not as readily available as an 8 inch. Mine didn’t rise quite as much as yours as it didn’t need any cut off. It did make it all the way to the top though. And yes, the box calls for an 8 inch pan but that’s if you make just one. A million thanks for posting this inonfmatior.